So here you see a picture of my new obsession and a new toy around our house. In contrast to other fibery things I have brought home, this item (a Louet Victoria spinning wheel) has everyone in the family curious. Peter kept asking me if I wasn't going to take it out of the box and when I finally did he took control and put it together and promptly started to play with it. After about an hour he cited that there is alot more skill in spinning yarn than he realized. Nik put the bigger Julia model together at the store and then all of the sudden was asking me about how to use it. He tried for a bit and had help from a couple customers that were knitting at the store that day. There is defintely an intrigue that goes along with the wheel. I have been bitten by the bug for sure. Stop by the store this Saturday and come play. 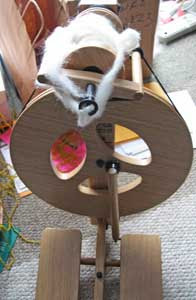 There will be the free spinning demos and some bead making with roving and awesome colors and lots of laughing.